So, I took the plunge. Well, in miniature. 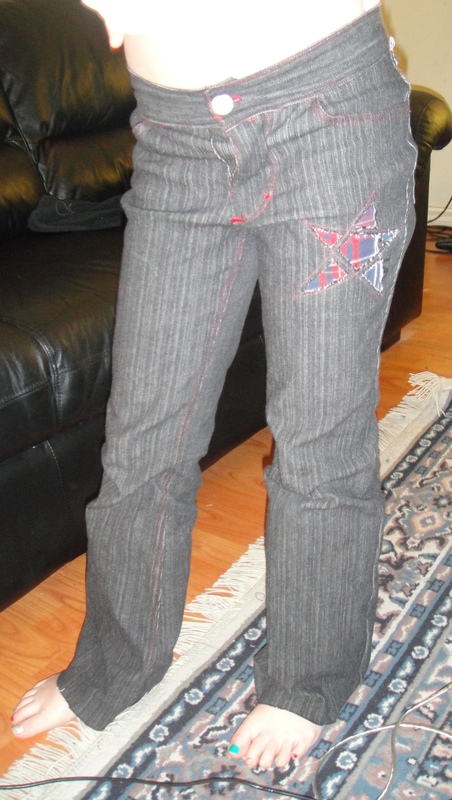 Just putting the finishing touches on a trial pair of jeans… for my daughter. A little torn—on the one hand, they’re very cute, but on the other hand, there’s enough booboos in the construction and fitting issues that I’m a little dissatisfied—more with myself than with the pattern, however. Oh, and the plaid flannel in the cut-outs is the same fabric as the pocket lining, and was a pair of my hubby’s pyjama pants long, long ago. So glad I kept those scraps! they fit! Like stretch jeans should… which may actually be a little snug. I LOVE the pocket design/yoke and front leg detail. We were inspired by a pair of jeans belonging to my younger daughter, and I think it’s so super cute. I am excited to see how it looks once it’s washed and frayed. The cut-outs on the front leg and the back yoke are both backed with another layer of denim behind the flannel, for strength. The pocket just has the flannel. Are these not the coolest pockets EVER, I ask you? much less chance for me to mess up, especially along short lengths. All in all the topstitching, though not perfect, is a LOT better than my last attempt. My “edgestiching” blind-hemmer foot definitely shows its limitations along longer seams, although that may be as much shoddy construction of the foot (the screw that adjusts the front extension is really loose, so it jiggles out slowly as you go along… this is just as much a problem for blind hems as for edgestitching). I also didn’t have any trouble catching the 1 cm seam allowances in my second row of topstitching; some people had complained about this in their pattern reviews. I added the perfect amount of length to the leg (1″) (at least as long as they don’t shrink in the wash any more)… they should be perfect once hemmed as is. I put buttons and buttonholes on the inside waistband to thread and adjustable buttonhole elastic through the back (a fave feature of mine for most kids’ pants these days). However, my gaposis-fixes were such that I don’t think she’ll actually need it. hammering REALLY helped with a few of the ultra-thick areas. I am impressed. I almost got the fly right on the first tr. Almost. The instructions say to attach the back pockets before you sew up the centre back seam. Despite marking very carefully and gluing the pockets in place so they didn’t shift around, they’re still not even. Next time I will definitely put them on AFTER the centre-back seam is stitched (which is the next step anyway so it’s not like it’s a big rearrangement. the yoke definitely needed adjusting for back gaposis. Now, my nine-year-old definitely has a booty for her age (to her father’s dismay), but on the other hand proportionately I doubt hers is any worse than mine, so I will definitely curve my yoke in a bit before I cut it. 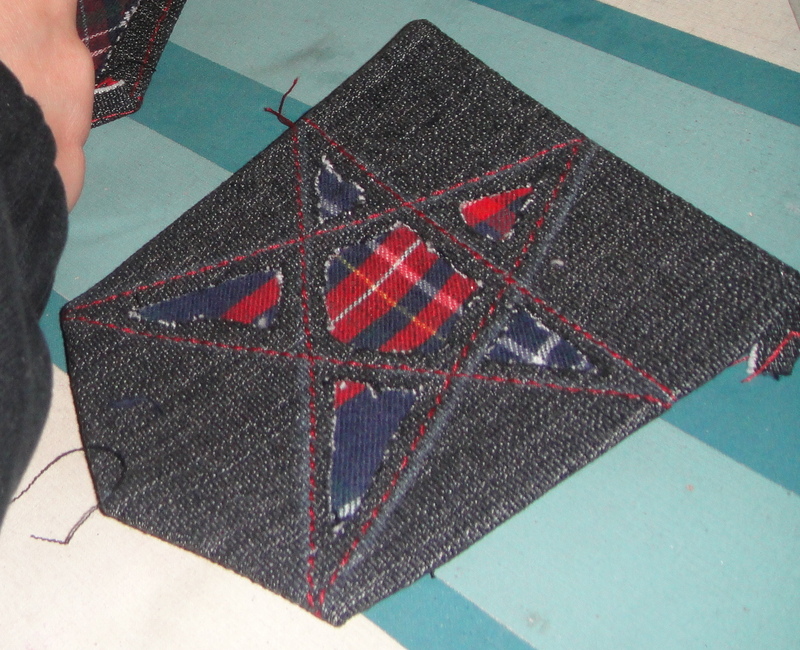 I adjusted the yoke at the sides (since the centre back, which would’ve been better, was already topstitched and I didn’t want to take tucks due to the cut-out peekaboo layers at the yoke), which left a bit of a pointy stop at the top side. 1) I cut it on the straight grain, non-stretch direction, rather than on the bias or the stretch grain. This is because I like pants that stay up… but I should’ve added to the length because it was a little short. 2) I didn’t interface it. This might’ve been fine with a heavy-duty denim, but this denim is so light and stretchy, it’s just floppy. My bad. I got lazy and impatient (and forgot). 3) I angled it in at the centre-back seam to further reduce gaposis, which was successful but left it with that little divet at the back. I am definitely excited to try my contoured waistband. Thoroughly interfaced. Wow, love those! I’m too lazy to make my kids’ jeans. I should though; they would love helping me pick out back pocket designs. So cute! My daughter is really tall and skinny so if she wants pants, I have to make them for her. I’ve been meaning to do jeans, but haven’t got to it yet. Do you have a link to the pattern? The pattern is Jalie 2908. It’s a really great pattern and comes in size 2 (kids) to 22 (women’s). You will probably have to lengthen the inseam for your daughter (I think I added 5″ to the inseam for my pair!) but that’s not hard. 🙂 These were a size K on a 60-lb, 4′ 4″ tall child.